I’m pleased to feature in March’s edition of Writing Magazine for Shelf life. We talk about the top five books that inspired my novels – spanning murder mysteries, poetry and cookery books! Writing Magazine is a lovely title that gives great advice on how to become a better writer. My own tip? Attend a course with Philippa Pride. She’s a brilliant teacher, wonderful person and Stephen King’s UK editor. THE heroine of this debut novel is a Hungarian Immigrant, Lena Szarka, who works in fashionable North London, cleaning rich people’s houses. When her fellow cleaner, another migrant named Timea, goes missing, Lena immediately suspects that one of their clients is to blame. They all seem to have secrets to hide. At first, the police do not seem interested, so Lena starts to investigate herself. Then Timea’s body turns up and the case suddenly takes a darker turn. Lena’s tenacity and common sense illuminate this engaging story by the granddaughter of a Hungarian immigrant to the U.S., who now works at a London investment bank. 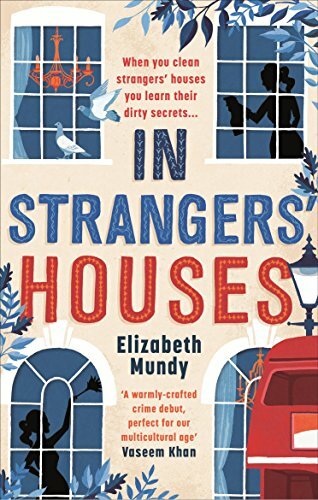 I’m delighted that IN STRANGERS’ HOUSES is a highlight of the month on The Crime Vault this February! There’s also a piece about my inspiration for the book. Just a warning: it gets messy. Read the article here. It’s finally here. I started writing IN STRANGERS’ HOUSES in Spring 2013 on a stunning yoga and creative writing holiday with Philippa Pride, AKA The Book Doctor. I finished my final draft in early 2016, found a fabulous agent in the spring, a wonderful publisher that summer, finished final edits by the winter and now it is ready to go into the world! Its beautiful cover is adorning the shelves of Sainsbury’s, Waterstones, independents and of course the virtual shelves of Amazon. My baby son Teddy helped me celebrate at 3am this morning with a dirty nappy – he didn’t want me to miss a moment of publication day. Thanks to everyone who has bought a copy so far – I hope you enjoy it! This is a refreshing and topical take on the British amateur sleuth: a Hungarian cleaner, who has access to the houses of the great and the good in London, is desperately trying to find out what happened to her missing friend and colleague by cleaning the houses she last serviced. By being entrusted with people’s properties for a few hours, Lena Szarka is able to draw conclusions, profile clients and follow a twisty trail that reveals sad and unpleasant truths . This was an entertaining and enlightening read. I enjoyed learning about Hungarian culture and the immigrant cleaner’s challenges in modern-day Britain and found Lena a likeable, intelligent and engaging protagonist. London and the other characters are very well drawn and the story runs along nicely, sprinkled with humour and mounting tension, as shocking lies and truths are revealed when Lena’s investigation reaches a climax.